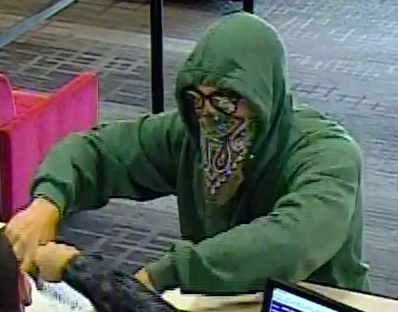 Pierce County Sheriff’s detectives need your help to identify the suspect responsible for an armed takeover-style bank robbery. At 6:00 p.m. on Tuesday August 15, 2017, the pictured suspect robbed a Bank of America located in the 17500 block of Meridian Ave. E. in South Hill. 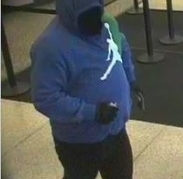 The suspect walked into the bank and displayed a small black handgun. 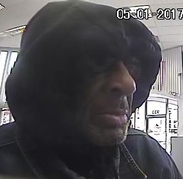 The suspect demanded cash from the tellers and ordered all of the customers to put their hands up and look away. The suspect placed the money into a white bag and ran from the bank heading in the direction of a nearby Fred Meyer store. The suspect is described as a white male in his 20’s with a slender build. 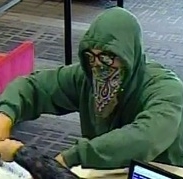 During the robbery he was seen wearing dark colored sweatpants, a green hoodie, black sunglasses, and had a bandana covering his face.